The Vivo X20 Plus UD smartphone is the first smartphone to use Synaptics’ under-display fingerprint sensor, and it has the potential to bite into Apple’s face recognition technology, announced the Teardowns service of ABI Research. Traditional fingerprint sensors are either embedded under the home key on the front of the mobile phone or on the back of the phone. Placing the fingerprint sensor under the display on the front of the mobile phone should allow for a borderless display on three sides of the display. The top still requires room for the front camera, proximity sensor, and receiver, etc. However, Vivo did not take full advantage of the new fingerprint technology from Synaptics. Vivo retained a significant border below the display along the bottom of the phone. “Vivo may have been cautious to fully commit to the new technology and left room to fall back to a traditional sensor below the display,” said Jim Mielke, ABI Research’s vice-president of the Teardowns service. 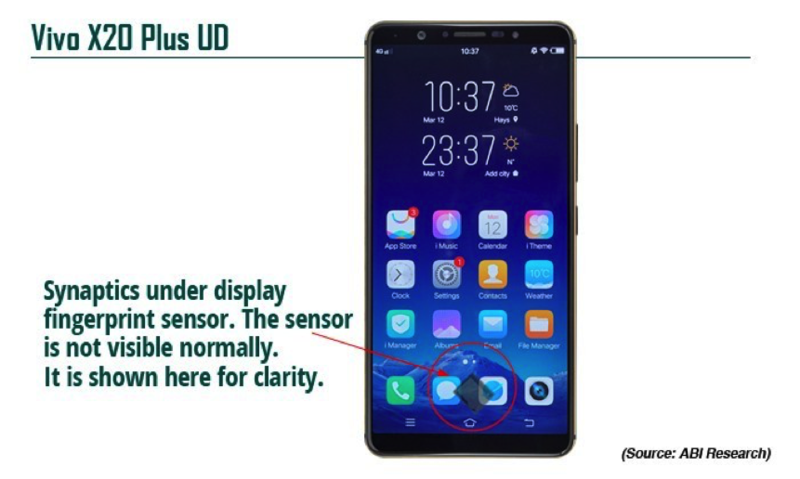 “The performance of this first implementation does warrant some caution as the sensor seemed less responsive and required increased pressure to unlock the phone.” Despite the non-optimal capabilities, the Vivo X20 Plus UD is well ahead of Apple’s face recognition technology. “Face recognition on smartphones is five times easier to spoof than fingerprint recognition,” stated ABI Research Industry Analyst Dimitrios Pavlakis (“Executive Foresights: Did Apple Miss the Bus – The Display – Integrated Fingerprint Sensor Gives the Industry a Much-Needed Push“). “Despite the decision to forgo its trademark sapphire sensor in the iPhone X in favor of face recognition (FaceID,) Apple may be now forced to return to fingerprints in the next iPhone,” added Pavlakis. Fingerprint sensors are increasingly becoming more relevant with a host of new banking, financial institution and payment service providers getting behind the technology. XDA-Developers have dug up info on two upcoming Xiaomi phones code named Comet and Sirius that use a Snapdragon 710 chipset – part of Qualcomm’s AI-focused 700 series rebranded Snapdragon 670. The two phones are mostly the same. Both have OLED screens with Always On Display, both run Android 8.1 Oreo with MIUI, both are dual-SIM phones with 3,100 mAh battery (or so), an IR blaster but no NFC. The major difference between them is that the Sirius model is set to have a notch on its screen and its selfie camera will offer portrait mode. Resolutions of any of the screens and cameras are unknown. As mentioned, both will use the same chipset, which has an octa-core processor with two Kryo cores (based on Cortex-A75) and six more cores (based on A55). The performance difference seems to between a Snapdragon 660 and the flagship 845.